Le Moindre - ZineWiki - the history and culture of zines, independent media and the small press. Le Moindre was a science fiction fanzine by Boyd Raeburn. Published in Willowdale, Ontario, Canada, Le Moindre was released during the 1950s into the 1980s. Issue #7 appeared in May 1957, #27 in February 1969, #29 in February 1972, #30 in 1973, #34 in February 1977, #35 in February 1978, #36 in August 1978, #38 in 1980, #39 in February 1981, #40 in February 1983, #41 in february 1984, and #42 in February of 1985. It was an apazine for the Fantasy Amateur Press Association, each issue varying in length from 4 to 20 (#38) pages. In his anthology of Toronto, Ontario fanzine writing Toronto the Ghood, Taral Wayne included the selection "Straw & Cold Cuts" by Boyd Raeburn, from Le Moindre #30, published in 1973. Many issue of Le Moindre included reviews of fanzines by editors such as Dean Grennell, Terry Hughes, Harry Warner, Jr., Helen Wesson, and others. 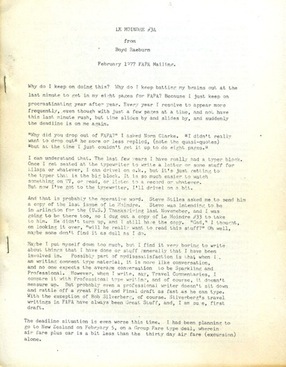 From Saturday, January 1954 till February 1959, Boyd Raeburn also published 11 issues of the fanzine A Bas, and then began co-published Queebshots with Norm Clarke and Georgina Ellis (editors of Honque, and Descant), a series of zines each with their own subtitle. 20 issues of this publication were released throughout the 1960s. This page was last modified on 19 October 2017, at 19:32.